Check out the winning projects these schools have done by reading the summaries below! Thank you everyone for your wonderful projects! They were amazing – Keep up the great work! We look forward to seeing your student-led action projects next year! Students in the Sustainability class at Okanagan Mission found themselves frustrated with the lack of knowledge amongst their peer group about global sustainability issues and the apathy most youth have towards acting to solve these issues. Together, they came up with an innovative entrepreneurial solution: Mission Roots Cafe. 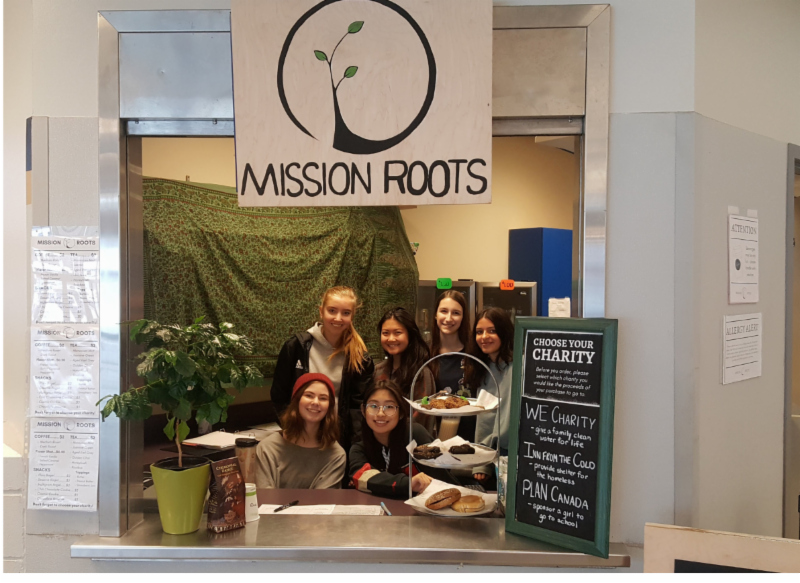 This in-school cafe is run and staffed by a team of 25 volunteers from grades 7-12, and it combines sustainable operations with a social enterprise structure that allows young people to make measurable change and become aware of their own power and agency. All proceeds from the cafe are donated to charities, which are selected by the students based on their transparency, traceability, and alignment with the UN Sustainable Development Goals. Every time a purchase is made at the cafe, the customer is able to “vote with their dollar” and choose the charity that will receive the donation. In this way, these students leaders use the cafe as a platform to educate and engage their peers. They also spread the word about reducing our own ecological footprints by using compostable cups and straws, composting coffee grounds and filters, and rewarding sustainable behaviours like bringing a reusable mug. The students have raised over $3,400 for their chosen charities this year, and they lead their school in further supporting the recipient charities with volunteerism. In conceiving of the cafe and working to make it a reality, these students report having developed and gained practical experience in a multitude of business and interpersonal skills including accounting, supply relations, marketing, employee management, customer service, cooperation, responsibility, leadership, communication, time management, and more! At LSF’s annual gala on June 14, 2018, students from the school, Angelica, Lauren, Skye and Summer introduced and gave a presentation about their Mission Roots Cafe project to attending business, government, and community leaders. They were then presented with the first place award by Giuliana Minardi, LSF Board Member and Senior Vice President, Operational Risk, Group Risk Management, RBC Capital Markets. Miles Macdonell Collegiate students took on two different initiatives this year. First they wanted to tackle waste from single-use plastics. Using creative thinking skills and entrepreneurship, the class held a workshop teaching staff and students to make their own reusable and compostable beeswax and cotton food wrap to replace plastic bags and plastic food wrap. To further promote their initiatives, the students planned and implemented an Earth Week sustainability campaign, where students who were observed participating in sustainable behaviours were entered into draws to win eco-friendly prizes like reusable water bottles or the handmade food wrap. They report that “students and staff have reported eye-opening transformations on their consumption of single-use plastics.” General awareness of sustainability in the school has also risen, and the student body voted to install an urban beehive on the school grounds next year! These student leaders planned fun and creative ways to engage their community in making change. For Earth Day, students organized presentations and workshop sessions from several keynotes and facilitators about topics ranging from Climate Change, Environmental Justice, Indigenous Art and so forth. View their posts here and here. An award ceremony will be planned in Fall 2018. Students at Guelph CVI envisioned sustainable and accessible gardening systems for their school that minimize the use of groundwater and help people of all abilities to connect to nature. They engaged their Green Industries class in designing and building raised garden beds with mechanisms for capturing rainwater and a timed irrigation system, thus developing their engineering and construction skills. Experimenting with aeroponic, hydroponic, and aquaponic gardens to choose the best method for starting seeds developed students’ knowledge and skills in these areas, as well as project design and management. Students also developed collaboration and networking skills by working with local community gardening groups and by collaborating with community gardeners to ensure health of gardens for the long-term future. This project was supported by LSF, who provided a grant for the project after GCVI students attended our Youth Leadership Forum in December, and Youth Fusion. Youth Fusion provides funding, staff, community mentors, and materials for local schools like GCVI to participate in a year-long Environmental Design program. Youth Fusion employs local university students to work alongside teachers for the full year, implementing the design, development, and creation of school green space improvements. Youth Fusion also provides access to year-long mentors like local Landscape Architect Paul Brydges to connect the youth to real-life industry professionals in the field. They are grateful for the community support from the University of Guelph, the City of Guelph, and the Upper Grand District School Board for making this project such a success!